There are literally hundreds of work boots and shoes on the market to choose from, each offering different benefits for users in various industries. Today we will examine the Keen Utility Flint Low Steel Toe work boot. This popular footwear option is quickly growing in popularity due to its unique design and style. This article will highlight the features of these work shoes, explain the best way to use them, and provide insight as to what work is best for them and what is not recommended. The Utility Flint Low Steel Toe by Keen is designed to provide lasting comfort and support for users. These shoes have a low heel with a half-inch platform that provides ample comfort for the soles of the feet. The interior design of these work shoes ensures comfort for all-day wear. The midsole is composed of a dual density compressed molded EVA and there is a removable metatomical dual density EVA footbed so users can choose the level of comfort that works for them. The asymmetrical steel toe feature provides lasting protection. The design is foot-specific, with a larger toe box that ensures toes are able to spread out and breathe properly. The toe box is molded and reinforced to safeguard your feet against mild impact and abrasions. This design ensures an adequate amount of flexibility and works to prevent pinching when the foot is in a hyper-flexed position. The fit and flexibility of the Keen Utility Flint Low Steel Toe work shoes are inspired by hiking boots. This brand ensures adequate comfort and an exceptional fit during every use. The design is snug in the heel and spacious in the toe so your feet never feel overly cramped during wear. The footbed design contours naturally to your feet, providing a snug yet comfortable fit with excellent arch support. These shoes are comfortable enough to wear on any surface. Construction workers. These shoes are comfortable and extremely protective. Warehouse workers. The Utility Flint Low Steel Toe shoes are comfortable and protective, which are necessary characteristics when workers have to stand on hard surfaces all day long. Carpenters. These shoes provide ample flexibility that is desirable for workers who switch between foot and knee work throughout the day. Individuals that travel for work. These shoes are protective yet comfortable to wear anywhere. Electric workers. These work shoes do not have met guards and will not provide protection against electrical shock. Extreme heat. These shoes hold up well under normal wear-and-tear conditions. They work rather reliably in cold and wet conditions, but extreme heat may be an issue for the sole. One user found the Utility Flint Low Steel Toe shoes by Keen to be an excellent option for both work and pleasure. Users working over 10-hours a day find these shoes to be extremely reliable and comfortable. While working in a warehouse, one user finds the steel toe to be extremely protective yet comfortable. A dock plate came down on one user’s foot and, thankfully, he had protection against injury. 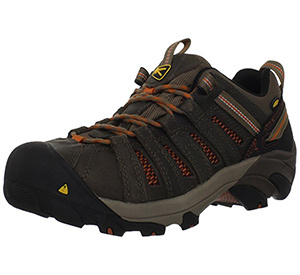 Hiking and other outdoor activities are also great activities to use Keen shoes for. One user purchased the Utility Flint Low Steel Toe shoes by Keen after previously injuring his toe. This user needed a shoe that was comfortable and reliable, yet spacious enough to allow his injury to heal without irritating it. These shoes did the job, allowing him to walk over 3-miles a day while on the job. In addition to walking extensively, this user does so in cold, damp cellars. The shoes protect, provide extreme comfort, and keep the feet warm during use. When it comes to selecting the ideal work boots, it is important to find a product that works for what you need it to. If you work in a warehouse, lifting heavy items, or in areas where heavy objects can fall from shelving, it is important to select footwear with a reliable steel toe. If you are going to be on your feet all day, you will need an adequate amount of comfort to get you through the long, hard days pain-free. Style, design, and materials are all finishing touches that either make-or-break a choice for users. Some materials aim for looks while others provide waterproofing, breathability, and odor protection. You should find work boots that are supportive yet provide enough flexibility for you to move around as needed throughout the day. If you change position a lot, you will want footwear that doesn’t restrain your ankles. Overall, the Keen Utility Flint Low Steel Toe work shoes are an excellent option for workers. Whether you are in construction, warehousing, carpentry, or just looking for a shoe that is comfortable and protective, these are an excellent choice. Keens are extremely affordable, reliable, comfortable, and they are of exceptional quality.